When it comes to consumers who are puzzled about mysterious new autonomous driving features, Robert Bosch has a plan: Show, don't tell. 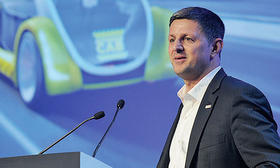 Bosch believes it is critical to show consumers what advanced new safety technologies will do for them to overcome future pushback, says Kay Stepper, vice president of automated driving for Bosch, who spoke Monday at the seminars. The technology supplier demonstrated here on Monday what it calls its minimum risk condition technology, which is designed to bring an automated vehicle to a safe stop, either in the lane or on the shoulder, when a driver fails to respond to warnings from the vehicle. "One of the concerns certainly that's out there still is lack of control, and basically trusting the machine to take over the driving task," Stepper said in an interview. "What happens if an unforeseen situation comes across that the machine was not trained for?" In general, car buyers are misinformed about the safety features in their vehicles, Stepper said. More than 20 percent of consumers believe electronic stability control is optional, but it has been mandated in new vehicles since the 2012 model year, according to a survey of 1,000 U.S. new-car buyers conducted by the supplier. Though Bosch has been educating consumers at events and through its online mobility academy - a virtual course on autonomous driving technology - Stepper said dealerships are the key area for communicating the capabilities of these systems. "It comes down to education in the dealership, that's where a lot of the conversation happens," he said. The company's minimum risk condition is intended to work in every driving situation, from gridlock traffic to highway driving. It works with Level 2 and Level 3 autonomous vehicles, which require human supervision, as well as Level 4 and Level 5, so-called high and full automation. The supplier demonstrated the vehicle on a one-lane road in Traverse City. When the technology was engaged, the car slowed slightly, pulled over to the shoulder and came to a stop without affecting traffic behind it. Seeing this backup technology - which kicks in only when the car decides it can no longer drive itself, and the human operator has failed to take over - in action could address concerns that failures in the driving system could result in a dangerous situation. "To experience what it's like when it actually happens, that is a completely different matter," Stepper said. "It's an important aspect to showcase and bring to consumers and the general public."